Anyone who ever saw the 1980s time-lapse cartoon of a fighter jet being stripped down and turned into a subway car has a good working definition of economic conversion. The concept hit its heyday around the middle of that decade. But it’s surprising to hear little or nothing about economic conversion as part of today’s efforts to build a low-carbon energy future. Transforming our antiquated, leaky, brittle energy system will depend in part on industrial capacity, and industrial capacity is exactly what economic conversion is about. The mid-1980s were a tough time to think about jobs that would build a cohesive, caring, civilian economy. Ronald Reagan was in the White House, and he was neither the saint nor the genius that people seem to remember today. His defence secretary, Caspar Weinberger, presided over the biggest peacetime military spending spree the world had ever seen. The Soviet Union responded in kind (then the U.S. responded again), and the Stockholm International Peace Research Institute (SIPRI) documented the annual opportunity cost: In 1988, Reagan’s last year in office, the world spent $1.6 trillion on military hardware and materiel. The point of economic conversion was to shift production to manufactured goods that wouldn’t kill or maim people and destroy infrastructure when used as directed. For a time, the movement built grassroot support and generated a small flurry of solid research. But after the Berlin Wall came down, military spending fell (though never below a mind-boggling $1 trillion per year), and the focus on economic conversion died out. Swords into ploughshares: In energy, economic conversion means shifting harmful industrial production to better use. 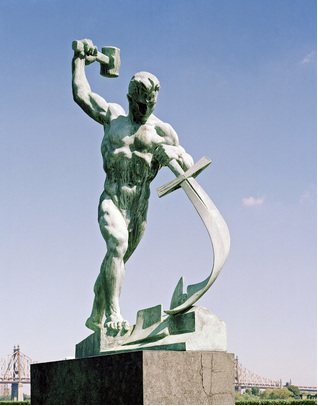 Photo of UN statue by U.S. Peace Council. We can’t afford that kind of attention lapse when it comes to jobs and production in the energy economy. We’ve known for years, courtesy of the Intergovernmental Panel on Climate Change (IPCC), that industrialized countries have until 2050 to cut their greenhouse gas (GHG) emissions by 80%—compared to 1990 levels—to avert the worst effects of runaway climate change. But atmospheric carbon concentrations crossed the “grim milestone” of 400 parts per million earlier in mid-May, and there’s no sign that we’re moving quickly enough to reverse course. As 350.org co-founder Bill McKibben pointed out last year, we can afford to emit another 565 billion tonnes of carbon dioxide by 2050 but, huge as that GHG budget is, we’re on track to use it all up by 2028. It’s too scary for too many people to think about leaving the old energy economy behind until they have a clear picture of the jobs created in the new one. The good news is that those dots are easy to connect. Clean energy projects announced in the U.S. in 2012 were expected to produce 110,000 jobs, even with the lion’s share of government subsidies going to fossil fuels and nuclear. And last November, Blue Green Canada showed that a green economy would deliver far more bang for the buck—six to eight times as many jobs per dollar invested in renewable energy, energy efficiency, or public transit—compared to the country’s current mono-focus on fossil fuel production. If the clean energy industries can cover this much ground in a mostly hostile political environment, what would happen to greenhouse gas emissions if governments actually got serious about climate change policy? With economic conversion as part of the policy mix, we’d have a better chance of finding out. 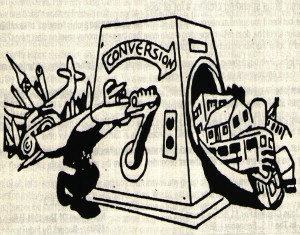 Let us know if you’re curious about economic conversion, or if you’ve had experience applying it to the energy sector. Mary Ellen Harte: Climate Change This Week: Virtual Coral Reefs, Hyperloops, and More!